Halloween has always been a fun holiday for me. People dress up in crazy costumes, everyone makes excuses for eating candy and every now and then you might just have to face your fears. It’s also a great time to hack on spooky projects that involve LEDs. 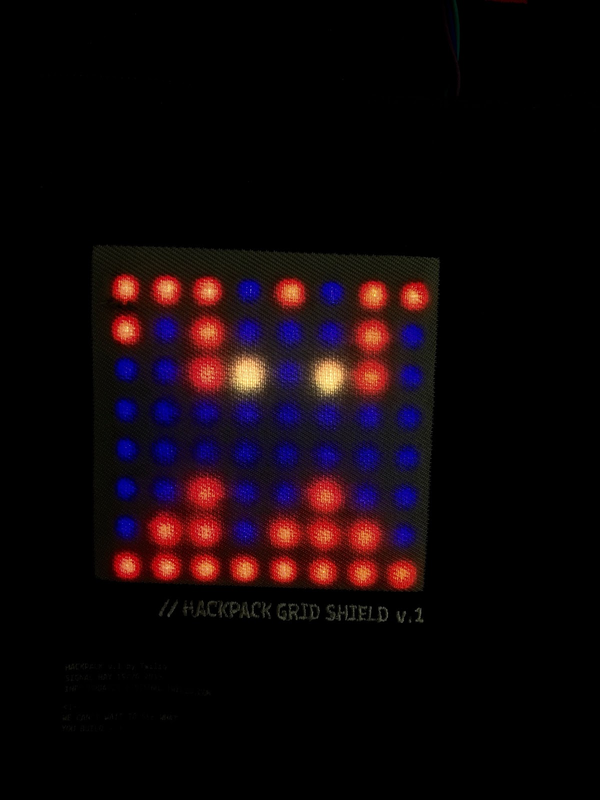 My favorite gear for hacking on LEDs is the hackpack we gave away at Signal this past year. In this post we’ll build an SMS-powered Halloween-themed hackpack. We’ll write code for the littleBits Arduino to draw a ghost and a bat with blinking eyes. Then we’ll embrace the frightening spirit of the holiday by doing something that seems utterly scary to me: using PHP to build our backend. There’s nothing inherently spooky about PHP itself, but it’s always a little scary to write code in an unfamiliar language. However, once our app is in place we’ll be able to update the spooky image shown on our hackpack using an SMS message. For some fun, you can send a text message to (215) 584-4678 with the word bat, ghost, pumpkin, spider or skull and it’ll update the image on my hackpack here in Philadelphia. A Hackpack: If you’re in possession of a Twilio Hackpack from Signal 2015 you’re good to go. If not, you’ll want to follow this guide to build your own. littleBits cloudBit: You’ll need a cloudBit to update the Hackpack based on an incoming text message. It’s not required for drawing the ghost and bat images though so if you don’t have a cloudBit you can still do everything else in the post. Arduino IDE: This allows us to write code and upload it to our Arduino. Run through this post to get the Adafruit libraries installed. After that, you can start with the code in this repo as a baseline for this hack. // Is the hackpack showing a bat? This is the starting image. // Is the hackpack showing a ghost? // A value of 1 means we’ll fade the pixel to purple. // This represents the body of the bat. // Set the eyes to yellow. The two-dimensional array at the top of the function indicates which pixels should be set to purple to make up the body of the bat. The for loop fades each body pixel from orange to purple. The last two lines in the function set the eyes of the bat to yellow. This is probably an excellent time to test and make sure everything is working properly. 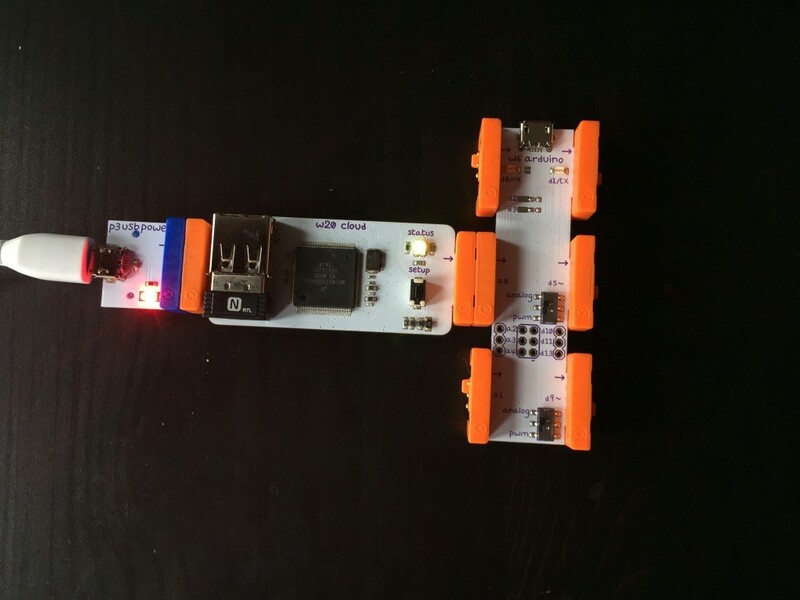 Connect your littleBits Arduino via USB and upload the sketch. 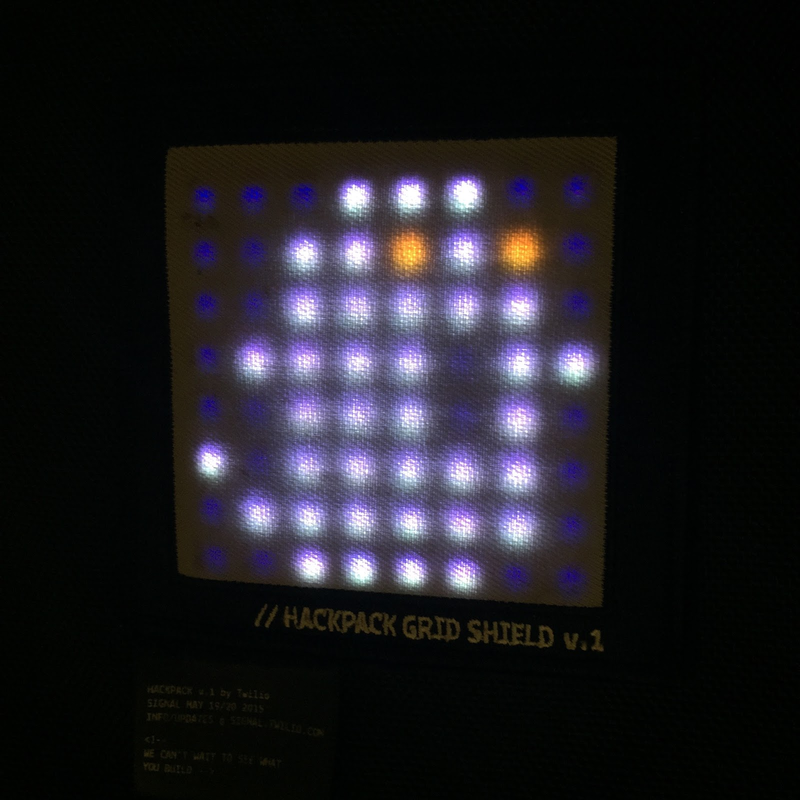 If all goes well, you should see a purple bat with yellow eyes on an orange background appear on your Hackpack display. This added lines will wait 5 seconds after the bat is drawn and then draw the ghost to the screen. Spooky lights indeed. Now that we have our images in place let’s make the hack interactive by adding the ability to switch images via SMS. The first highlighted line fetches the Body of the text message that was sent, removes whitespace from it and makes it lowercase. The next highlighted section configures the data we send in the POST request to the littleBits cloud. If a ghost was requested we set the cloudBit to 75% for 2 seconds and if a bat is requested we set the cloudBit to 25% for 2 seconds. I’ll explain what the 25% and 75% mean in terms of the Arduino code in the next section but if you’re curious you can read more about it in the littleBits API documentation. Otherwise we let the sender know what commands to try instead of whatever they sent. Finally in the last highlighted section we respond to Twilio with TwiML to let the texter know we’ve set the Hackpack to their requested picture. Now we just need to modify our Arduino code to handle the cloudBit input value that’s being set in our Laravel code. The key here is the analogRead(cloud) call which checks the value of the cloudBit input. The 25% and 75% that we set from the Laravel code roughly map to 250 and 750 but to be safe we check a range of values. The isBat and isGhost bool values help to ensure we don’t redraw the requested picture if it is already displaying. That’s everything we need to make the hack work. Upload the sketch to your hackpack and send ghost or bat to your Twilio number and you should see the Hackpack update based on which word you sent. Halloween and hacking were made for each other. Let me know what kind of cool things you are working on!